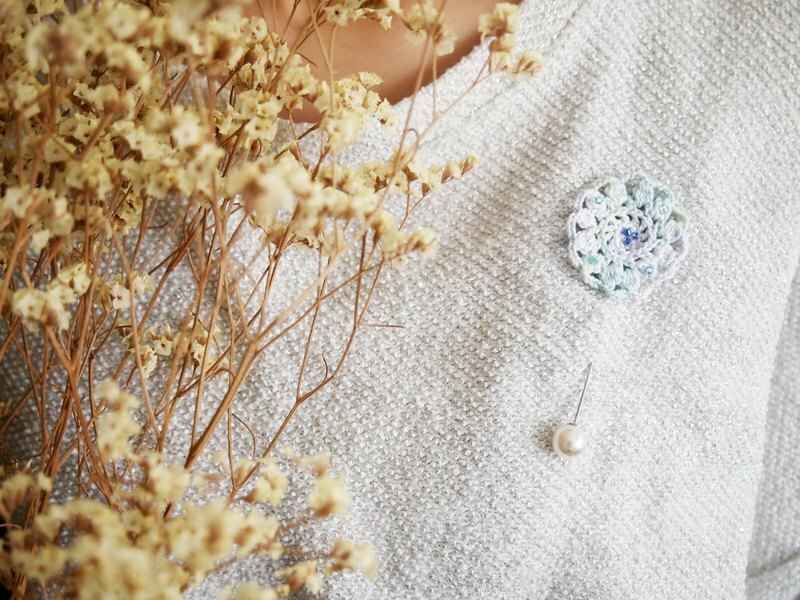 Cute blossom crochet brooch with with synthetic pearls will make an eye-catching addition to any outfit and any occasions. All of our handcrafted accessories are both lightweight and exquisite. ♥ Handmade Item ♥ Material: Cotton yarn ♥ Primary color: lightblue ♥ Width of the crochet flower : 40mm ♥ Length of the brooch : 88mm ♥ Holiday: Celebration, Anniversary ♥ Design and handcrafted in Hong Kong ♥ Ships worldwide from Hong Kong ♥ Comes in a cute little package ready for gift giving ♥ Condition: Brand new https://www.youtube.com/watch?v=X3-puSYT7DY&feature=youtu.be Just Knitting specializes in designing fashionable, yet amuse and one of a kind jewelries and accessories. The concept of brand is to praise and reminisce the traditional knitting technique by integrating conventional handcraft with contemporary material. https://farm1.staticflickr.com/499/20310905446_85532c5587_b.jpg https://farm1.staticflickr.com/501/20328690872_5baccd0506_b.jpg https://farm1.staticflickr.com/266/19716687564_599582d289_b.jpg https://farm1.staticflickr.com/371/19718356183_0b611846cf_b.jpg https://c1.staticflickr.com/1/566/22712124868_d88f0d7d82_b.jpg We have our own brand alloy logo plate on each bracelet or necklace. We always strive hard to explore new knitting methods and create new accessory series, here are our design! https://c2.staticflickr.com/2/1489/26769519815_2a32b2e424_b.jpg https://c2.staticflickr.com/2/1508/26166102133_f733eab524_b.jpg https://c2.staticflickr.com/2/1489/26702499231_44e4d20091_b.jpg https://c2.staticflickr.com/2/1461/26702499171_5c606f2d18_b.jpg https://c2.staticflickr.com/2/1468/26702499151_c5405ce57f_b.jpg https://c2.staticflickr.com/2/1504/26702499081_2abbd4e193_b.jpg https://c2.staticflickr.com/2/1461/26702499121_fc7669dcc8_b.jpg We aim to offer fashion jewelries with a stylish twist. After taking the Experimental Jewelry Class in London's Central Saint Martins College of Art & Design, Sophia was evoked by what she has learnt and seen in the UK. She then partners with Rainnie to establish a new jewelry and accessories brand, Just Knitting. Every piece made us is meticulously hand crafted and hope they can find someone who love them. https://farm1.staticflickr.com/520/20149149158_de6dac5bc4_b.jpg Below are some interview clips by Milk Magazine, AM730 newspaper and School of Textile Design in the Hong Kong Polytechnic University. https://farm1.staticflickr.com/419/19716173053_ea8b5c9390_b.jpg https://farm1.staticflickr.com/371/20337170625_34513c401b_b.jpg https://c2.staticflickr.com/6/5814/21315638934_11b6c34569_b.jpg ♥♥♥Love our design? please "LIKE", share and follow our Facebook & Instagram! It's an easy way to keep up with the latest news about Just Knitting /Care Instructions/ 1. To keep its best form and look, suggest not to wear it when taking bath and shower and avoid any chemical, sea water etc. 2. Do not bleach and dry clean. 3. Each accessory comes along with simple but nice packaging.